Free event, all ages welcome! This is a free event. The story will be told by a Deaf professor. Social time starts at 6:30 p.m. and the movie starts at 8:30 p.m.
You can purchase movie tickets online and order food/drinks at the Alamo Drafthouse. This is a free event and there will be snacks and drinks for sale. This is a free event and all ages are welcome. You can purchase tickets at www.theplayhousesa.org. The 2016 Texas State Independent Living Conference will be held April 3 – 5, 2016 in San Antonio at the Hilton San Antonio Airport Hotel. This year’s theme is “Innovate,” and the conference is devoted to discussing the issues, technologies and services that empower disabled people to live independently. mixers provide the opportunity for participants to mix and mingle with one another, setting the tone for collaboration, creative connections and fun in an energizing atmosphere with music and appetizers. DIS will be providing sign language interpreters and captioning at the event. For information on accessible accommodations and needs at the conference, email conference@txsilc.org. To learn more and to register, please visit the website. Register with the Eventbrite link (see flyer) or at the door. This one-hour information session will introduce interpreters to the Health Insurance Portability and Accountability Act (HIPAA) and will highlight how it applies to interpreters who work in medical settings. A pre- and post-test will gauge participant's knowledge, and interpreters will leave with resourcing about how to talk about HIPAA with medical professionals. 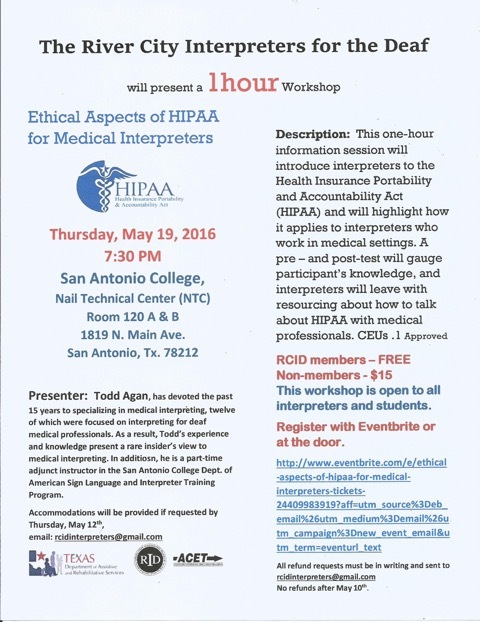 This workshop is open to all interpreters and students. Come one, Come Fun and Come ASL! 93rd Family Day DOCM: Finding Dory! Cost: $5.00 Extravaganza Ticket per person. Hosted by Nikki Gomez and Michael Razzen. Come Socialize, Learn and Gain Knowledge. Hosted by Jonathan Galloway – contact him on Facebook or call Nardis to sign up and for cost information. This class will be entirely in ASL. The class consists of a shooting qualification, 4-6 hours of classroom instruction, and a written test. You also have to fill out an application with DPS and submit paperwork you get from class. 8:30 a.m. - 1:00 p.m.The University of Texas at San Antonio, downtown Bill Miller Plaza located at 501 West Cesar E. Chavez Blvd. What: San Antonio Americans with Disabilities Act (ADA) celebration begins with a lively Pep Rally! 50 Diverse Community Resource Exhibitors, ADA T-shirts, Community Awards and Free Lunch for Attendees! A very special keynote speaker, Ms. JoAnne Fluke will share a motivational story for all attendees! Our Honorable Senator Jose Menendez will be honored as our Public Servant of the Year! The 26th Anniversary of the Americans with Disabilities Act (ADA)celebration will focus on the importance of ensuring that everyone in our community has access to programs and services and included in all aspects of life! Why: The Americans with Disabilities Act (ADA) is the most important piece of legislation to help persons with disabilities. It literally changed the future for persons who have disabilities when signed into law in 1990.
Who: Developed in 1981, San Antonio Independent Living Services (SAILS) is a federal and state designated center for independent living aimed at serving persons with all types of disabilities in Bexar and twenty-seven surrounding counties. The core services include independent living skills, advocacy, information and referrals, and peer mentoring. In addition, SAILS provides also free services to persons who are homeless and disabled. To celebrate the 26th anniversary of the ADA, San Antonio Independent Living Services (SAILS) is partnering with and extends special thanks to our sponsors: AmeriGroup RealSolutions, VIA, Superior Healthplan, HEB, Gordon Hartman Family Foundation, Grande Communications, Partners in Primary Care, Deaf Interpreter Services, Ageless Living Home Health, IKOR, Alamo Council for the Blind, PCSI, The Unicorn Center, Family Endeavors and more! Call 210-281-1878 extension 118 for sponsorship. One day event will provide training in empowerment, advocacy, government relations. Childcare provided. Come socialize with all deaf, hard-of-hearing, or any hearing individuals that knows sign language! Come meet Santa and other characters! Come eat, socialize and meet new people! After 9pm we will all go to Starbucks to chat some more! Free CEUs: .3 DHHS BEI CEUs (Ethics/Interpreting) are approved. CEUs provided are Deaf and Hard of Hearing Services (DHHS) CEUs and are recognized and accepted by the Texas Board for Evaluation of Interpreters (BEI) as CEUs for BEI certified interpreters. To earn CEUs each individual must be logged into the webinar system and participate in the interactive session, as well as complete a pre-test and a post-test. For those viewing in a group, please contact dhhs.webinar@hhsc.state.tx....us for further instructions. If you need RID CEUs, contact an RID CEU provider in advance of the session to request PINRA approval to earn CEUs. The training will be presented in American Sign Language; voice interpreters will be provided. To request other auxiliary aids or services necessary for effective communication, please contact dhhs.webinar@hhsc.state.tx.us.